Whew! What a week! I have been so busy around here, and the changes are exhilarating. I’m excited to show you what we have accomplished so far! This week has been about furniture: cleaning it up, building, and installing. Wait until you see our $10 headboards! First things first: the wall color. Confession: we had the room painted a few weeks ago. We were having a house full of company, and I just didn’t want to get hung up on that little/big detail in the whole process, so it is done. I chose Kelly-Moore Aqua Ocean (KM5060-1) for the walls. It is the perfect aqua-turquoise goodness, and it sets off that amazing vintage map of Hawaii perfectly! For an accent on several projects we are also using paint two shades darker: Kelly-Moore Hawaiian Vacation (KM5062-2). Using two colors in the same family but two or three shades apart is a great decor trick! With the lighter color on the walls and the darker shade as an accent, we have created a gradient in the room without literally painting a gradient on the wall or furniture. Not only do these colors evoke Hawaii, but they are also perfect Mid Century turquoises. When the wall color first went up, it felt a little 50s diner to me. Now with more wood in the room, it is reading quite Atomic Ranch. As I have said many times, we aren’t restoring a historic home. This isn’t going to be a museum. I’m not doing Mid Century for Mid Century’s sake. I’m doing what I love, but what is also appropriate to this 1958 home. This color is one of my favorites, AND it is historically appropriate, too. With the wall color up, it was time to tackle the furniture. 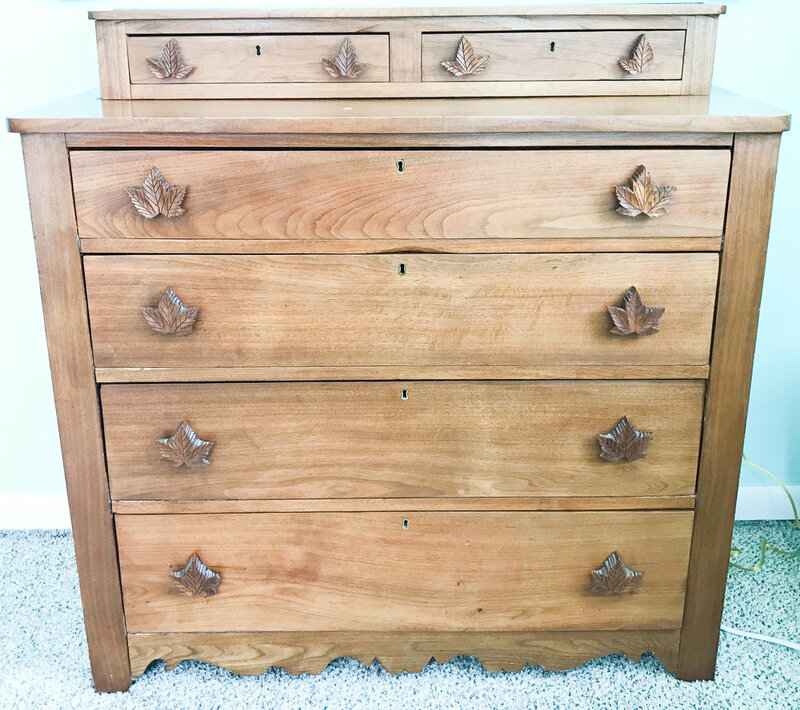 Last week I showed you the existing pieces with which we have to work: two twin Espevar beds from Ikea, an antique dresser, a Mid Century bench, and a small, possibly- vintage table with faux bamboo legs. Because I am working on a budget, I am using what we have as much as possible. But I wouldn’t go out and buy all new furniture for this room even if I had all the money in the world! Buying vintage pieces when possible is the most economically and ecologically responsible way to go. When shopping vintage I am almost always supporting a small business or a family. Big businesses have their place, don’t get me wrong, but when I can I look to shop locally and shop small. And I’m reusing wood that has been cut and energy that has been expended rather than consuming more. So thrifty, eco-friendly, and creative? Yep! Let’s get started! I bought headboards for this room nearly a year ago. But over time I realized that they just weren’t right. I never even put them on the beds, and I sold them — part of the funds for this project! So we needed headboards, and I wanted them to be as cheap as possible. One day inspiration struck: closet doors. Our closets all have horrid sliding doors that are completely dysfunctional. So we used two of them to create one long, sleek headboard tying both beds together. All told, we spent $10 on the headboard, using stuff we already had around the house. That gave me money to spend on the beds themselves. I ditched the Ikea legs, and we ordered hairpin legs for each bed. My husband devised a clever way to attach them to the bed bases, and he and Bambino painted the beds in the deeper accent color (Hawaiian Vacation). I put together detailed instructions for making the headboard and hacking the Ikea Espevar foundation which include all of our steps and the materials we used. This method for making could easily be adapted for an upholstered headboard and beds of any size. I even show you how to make a French cleat which will hang anything securely on a wall! I hope you’ll check them out! We weren’t done with hairpin legs yet! I wanted a place for guests to keep suitcases, and I can’t stand those folding suitcase racks. They are horrid! 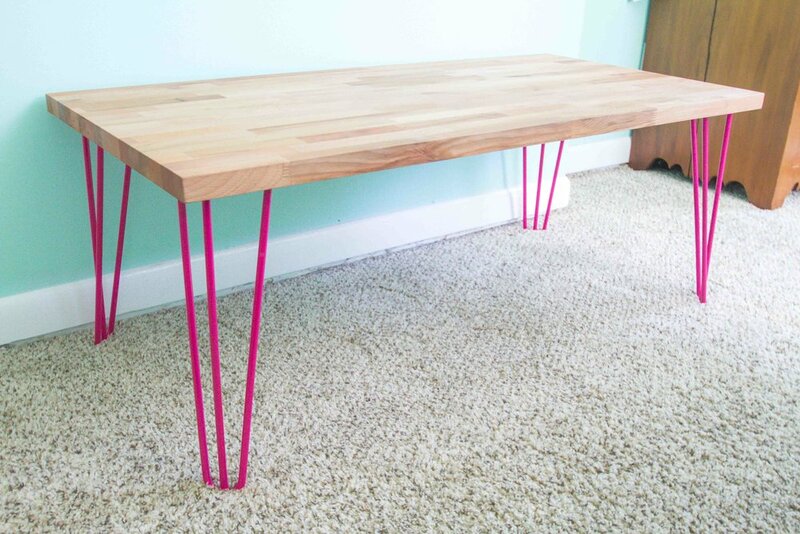 So we ordered another set of hairpin legs — this time in hot pink and 18” tall! We had a scrap of butcher block countertop in the wood studio which made the perfect suitcase bench. The legs just attach with four screws. Voila! The hot pink legs are just cheeky enough against the aqua walls! Both the table and the dresser got my favorite furniture cleaning-refresh treatment. First, clean it well with a damp cloth and a tiny bit of dish soap. Then rub the whole piece down with a clean damp cloth. Dry. 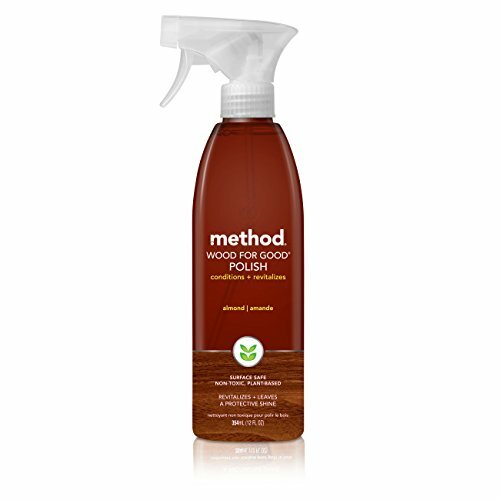 Then spray with Method’s Wood for Good and wipe down. Finally apply real beeswax. Rub it in. Let it sit. Then wipe it off. Beeswax is great for almost all wood surfaces, but try it in a small spot first. It is amazing! This is how we have always cared for wood countertops (which we put into both the 1948 Subdivision Sweetheart and the 1980s Cabin in the City). It brings out all of the beautiful colors in the wood. I also replaced the knobs on the table. 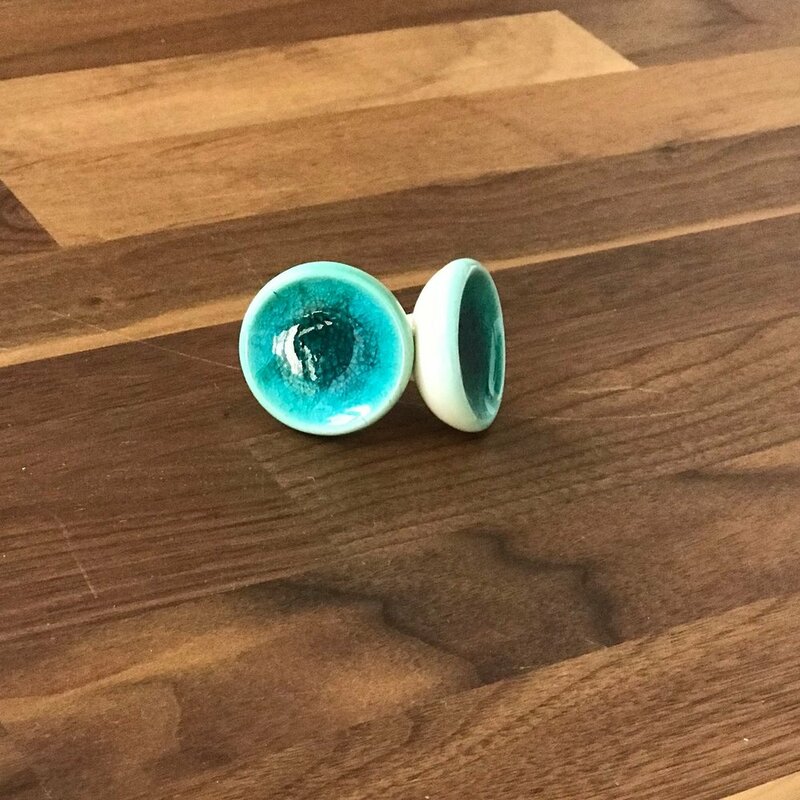 I ordered these porcelain knobs from Etsy. They have a crackled glaze that is so beautiful, and the color is amazing! There is nothing Mid Century about this piece, which is fine. It is lovely! But it doesn’t really go in the room as is. So, I took off the glove box top which wasn’t even attached any more. The glove box was once glued on and the wood underneath isn’t finished, so someday I may refinish the entire piece. But for now, I’m searching for just the right runner to drape over the top which will hide the damage and also pop with color. I removed the pulls to clean them — the maple leaves collect a LOT of dust. I’m still on the fence about the pulls — I may just replace them and tuck these hand-carved pulls into a closet for another day. For now it has no pulls while I decide. But I also scored this HUGE, beveled mirror to hang above the dresser for… wait for it… FREE on the Facebook Marketplace! In pieces as I write. It needs to be glued and screwed together again, then sanded and… I am not sure what finish I will apply yet. And I haven’t quite found the right fabric for the seat. That’s a fun hunt, though. So here we are at the end of the first full week. The furniture is nearly done. I have a gigantic bruise on my calf — acquired while taking photos for this post. But I also scored this amazing Mid Century lamp this week, and I’m excited to show you that and the rest of the lighting and window treatments for the room next week! I am on a bit of turquoise overload. It is time for some other colors in that room, too! I’m off to keep working! Be sure to check out the two how-to posts from this week. And stop by to see some of the amazing transformations happening with the other #OneRoomChallenge participants. I am inspired. Every. Single. Day. 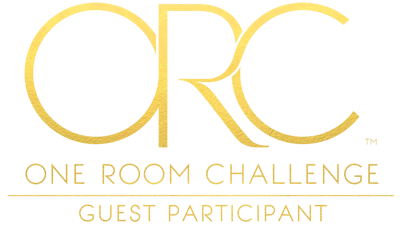 Don’t miss a single update: sign up and each installment of the One Room Challenge will come directly to your email on Thursdays! And be sure to stop by the One Room Challenge Blog to check out the other creative renovations happening across the country. You can also follow #oneroomchallenge and #bhgorc on Instagram for more inspiration! Be sure to follow me, too!